appeared in 1997. can’t believe, won’t believe is its second release, just 21 years later. Good things, as they say, come to those that wait. Dankworth, Gil Evans and George Russell and has a long history as a session player, a performer with classical ensembles including the London Philharmonic and a free improvising musician. The pervading mood on can’t believe, won’t believe is relaxed and calm—the calmness that comes from a confidence in one’s talent, the knowledge that there’s nothing to prove. This is, after all, a quintet featuring some of the finest jazz musicians on the scene. Saxophonist Pete Hurt (Carla Bley Very Big Band, Andy Sheppard), pianist Barry Green (Ingrid Laubrock, Charles McPherson, Brigitte Beraha), bassist Dave Green (Sonny Rollins, Stan Tracey) and drummer Paul Clarvis (Herbie Hancock, John Taylor, Kenny Wheeler) are as masterful as their bandleader. The band is well-named: to quote a second cliche, still waters run deep and beneath the calm there’s plenty of musical passion. These six Lowther compositions are followed by the band’s elegant take on “Some Other Time.” It’s a gorgeous version, an object lesson in “less is more,” with Lowther’s performance of the melody underpinned by precise, low-key, backing from the rhythm section. The album closes with the brief “For Pete,” Hurt’s elegy for Pete Saberton, the original Still Waters pianist who died in 2012. 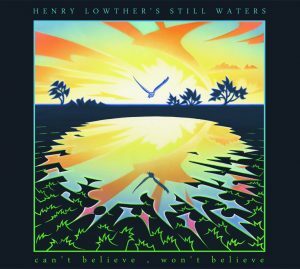 So, 2018 opens with the excellent can’t believe, won’t believe, from the equally excellent Henry Lowther’s Still Waters. The bar is set high. If the rest of 2018’s jazz albums get close to the quality of this truly delightful work then it’s going to be a vintage year. Henry Lowther’s band Still Waters releases a second album after a 20-year pause. Trumpeter Henry Lowther has been a creative mainstay of British jazz for half a century and he’s as happy playing mainstream standards as he is duetting with a computer musician in free improvisation. He’s the man who reassured Miles Davis (Dave Holland introduced them) that yes, playing jazz trumpet in a rock context was perfectly possible. Now, a couple of decades since 1997’s ID, Lowther’s band Still Waters, formed to explore his compositional interests, has released a new album of gorgeous, limpid tunes that make for thoroughly seductive listening. This impeccably recorded music is by turns playful, elegant and ingenious, with Lowther’s legendary warm, rich tone very much to the fore. The band is highly empathetic, with saxophonist Pete Hurt as the perfect fellow frontman and drummer Paul Clarvis knowing exactly when to give the music a cheeky prod. One to cherish. Henry Lowther (trumpet/flugel); Pete Hurt (tenor); Barry Green (piano); Dave Green (bass); Paul Clarvis (drums). The trumpet player has long been regarded as the flashy extrovert of any band or orchestra. The stentorian tone of the instrument can drown out the loudest drummer, even, we’re told, bring down the walls of Jericho. Buddy Bolden, it was said, could be heard at the other side of Lake Pontchartrain – a distance of 20 miles. 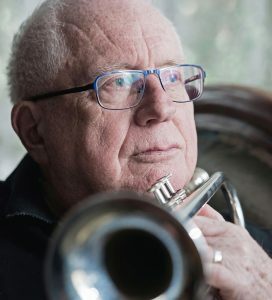 Hearing such trumpet players as Louis Armstrong, Harry James, Dizzy Gillespie, Maynard Ferguson, Arturo Sandoval, Kenny Baker and Bruce Adams live or on record serves as a further reminder of the instrument’s power. And yet, running parallel to the bombast of the above there’s also another group. Players more minimalist. Introverts who, nevertheless, show that less can often be more. Bix, Bobby Hackett, Miles, Chet and, more recently, Tomasso Stanko and Laura Jurd all belong to the latter school. This is only Henry Lowther’s Still Waters’ second album, the band’s debut album, ID, going out in 1997, it is, nevertheless, well worth the wait. No tear-arse tempos nor, by the same token, are there any ten minutes long circular breathing exercises. Instead, it’s clean, relaxed playing. It’s a warm shower on a cool night, or a Pina Colada with lots of ice on a warm summer’s evening. You let the music envelop you – it’s more intoxicating than any cocktail – and you remember just how good a trumpet player Henry Lowther was and still is. This is Bix and the girl saying ‘yes’ all over again. Up front with him, on tenor, Pete Hurt maintains the mood. Light of tone with a sackful ideas, Hurt proves the perfect partner for Lowther. Barry Green lays down some delightful piano. No other words fit – delightful it is! Dave Green, long the doyen of UK bassists, doesn’t put a finger wrong – he never does. I could make that statement without listening to the record and I wouldn’t be open to contradiction. However, I did and I wasn’t! Paul Clarvis does the job as professionally as he always does. Six originals by Lowther, one by Hurt and Bernstein’s Some Other Time. Don’t ask me for the other titles. Dark text on a slightly darker background doesn’t make for easy reading. Still, you don’t listen to the sleeve! 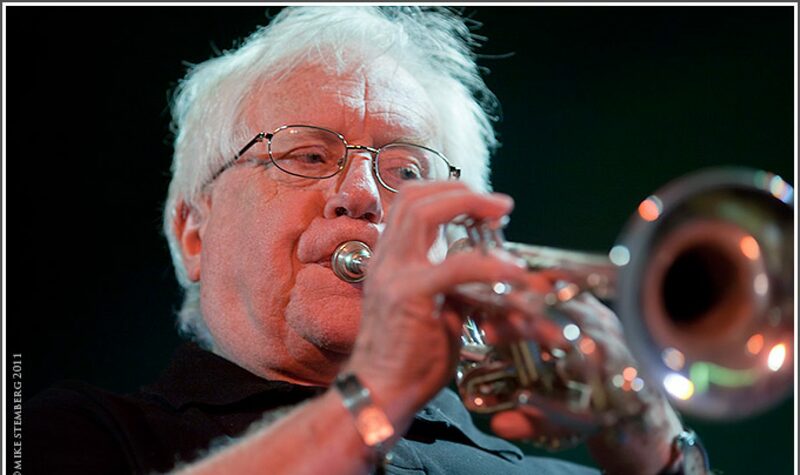 Trumpeter (and one time violinist) Henry Lowther is one of the veterans of the UK jazz scene having begun his career back in the 1960’s. This was his second gig of the day having played with Jim Mullen in their “Great Wee Band” earlier at the Guildhall. Unfortunately the hall was jam packed for that one and I couldn’t get in. Nonetheless I was looking forward to this second opportunity to see Lowther in action. The Still Waters quintet is the main outlet for Lowther’s considerable compositional skills, but to the best of my knowledge the group has not recorded since 1997 when the album “I.D.” appeared on Paul Clarvis’ Village Life label. Drummer Clarvis appeared with Lowther today along with other album personnel pianist Pete Saberton and bassist Dave Green, the latter also a member of The Great Wee Band. Another long time collaborator, saxophonist Pete Hurt completed the line up having taken over from the album’s JulianArguelles. The group opened with a segue of Lowther compositions with “Can’t Believe, Won’t Believe” flowing seamlessly into “I’ll Be Glad”. After the fanfare opening there were fine solos from Lowther on trumpet, Hurt on soprano and Saberton at the piano. Lowther takes a delight in creating quality jazz from unlikely source material. There is a beautiful version of the Christmas carol “In The Bleak Mid Winter” on the “I.D.” album. Here he chose Richard Rogers’ “Oh What A Beautiful Morning” from the musical “Oklahoma”. An ironic choice given the weather this saw Hurt switching to tenor in a surprisingly effective rendition of the tune. Lowther is something of a polymath and possesses a fearsome intellect. His announcements were dry and succinct, full of mordant wit and with an ironic air of the “grumpy old man” about them. The apparent influence of London’s North Circular Road on his choice of song titles bordered on the surreal. Saberton took the compositional honours for “The Snake And The Tiger”, a slowly unfolding piece that saw Lowther deploy both the muted and open horn with Hurt again on tenor. Although it is over a decade since “I.D.” was released a couple of the tunes from the album still remain in the group repertoire. The beautiful “Golovec” featured a solo bass intro by the peerless Green and Lowther’s lyrical touch on flugel horn. “Veneer Of The Week”, another North Circular inspired title (don’t ask!) saw the group up the tempo and allowed the leader to demonstrate his agility on the trumpet. There was also a feature for the irrepressible Clarvis. Another tune from the “I.D.” album closed the set. 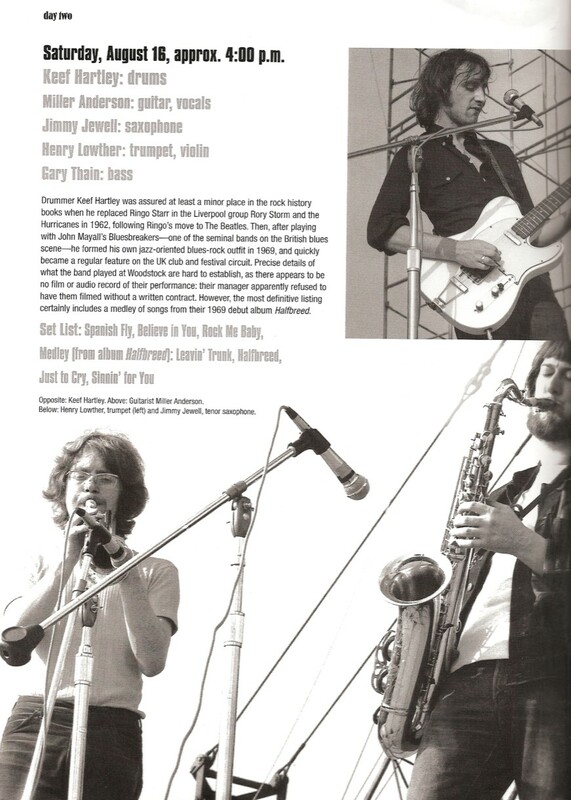 “White Dwarf” featured staccato rhythms and solos from Hurt on tenor and another outing for Clarvis. A knowledgeable crowd gave this quintet of seasoned musicians a great reception. It’s high time Lowther found his way to a recording studio again.